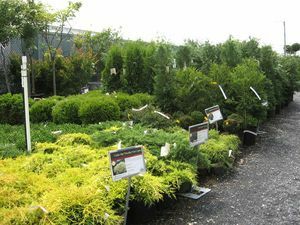 Milmont Garden Center has many sizes and varieties of trees and shrubs to choose from. Milmont Garden Center is known for quality Trees and Shrubs. With hundreds of varieties available, the Milmont shopper is sure to find many plants that will work well in any landscaping design. For our large collection of Roses, please click here. Here are a few definitions that may help when choosing trees and shrubs for your yard. DECIDUOUS - plants which completely lose their foliage for part of the year. Generally refers to trees or shrubs that lose their leaves seasonally. CONIFER - conifers are trees that do not shed their leaves during winter. Some common examples include: cedars, douglas-firs, cypresses, firs, junipers, pines, redwoods, spruces and yews. EVERGREEN - plants which keep their leaves year round. A Milmont staff member will be glad to answer any questions you have. Please stop by and let us help you choose the plants most suitable for your yard and landscaping projects.